Farmer Jim stopped in the field he was harvesting. Morty hopped off with the saw in his hand, and began to search. My tree has to be perfect, he thought. It has to be shapely, and full, with branches all around. It cannot be too big because my room is small. Morty wandered through the rows of trees. Most of them were already five to six feet tall. Many had bare spots, and deformed branches. With so many trees, picking the right one was not easy. He stopped in front of a Blue Spruce to ask for help. “So was I,” answered another spruce. Morty kept walking up and down row after row of trees. He finally stopped in front of a very tall Balsam tree. “Thanks,” said Morty. He took the Balsam’s directions, and counted as he walked. When he reached number twenty, he turned left and counted five more. There, in the center of a small clearing stood a beautiful blue-green spruce tree. It was perfect. I can’t believe it, he thought. Morty was speechless. He walked around the tree, looking for bare spots; there were none. “It is as tall as I am, and it is shaped like a perfect cone.” He circled the tree over, and over, looking, and thinking, this tree will make a perfect present for Jesus. He examined the tree from all angles. He couldn’t find a single flaw. He finally broke his silence, and spoke. He came to the sign: Covert Tree Farm, Christmas Trees for Sale. 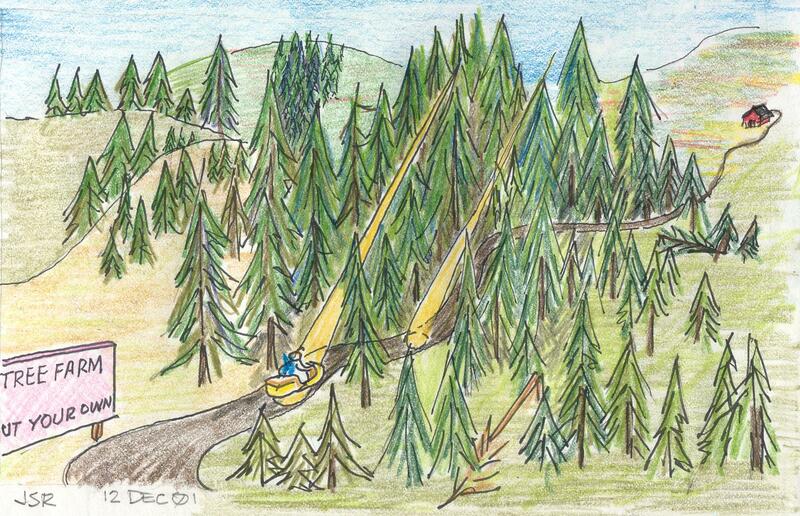 Morty slowed Sky-scooter, and made a sharp right turn into the opening between the trees. The gravel drive wound through a grove of spruce trees. The tall trees shaded the forest floor, and kept it dark. Occasionally, a bird flitted from tree to tree and sang a sweet song. A beam of sunshine peeked through. God is shining a spotlight on me he thought. The ferns under the spotlight were lime green surrounded by dark green in the shade. “These twists and turns are fun,” he said to Sky. He talked to his scooter whenever he was alone. Morty steered through forest leaning one way, then the other. His curl swayed from side to side. He was anxious to find the perfect present for his Boss. An opening of bright light led into the meadow where the farmer lived. 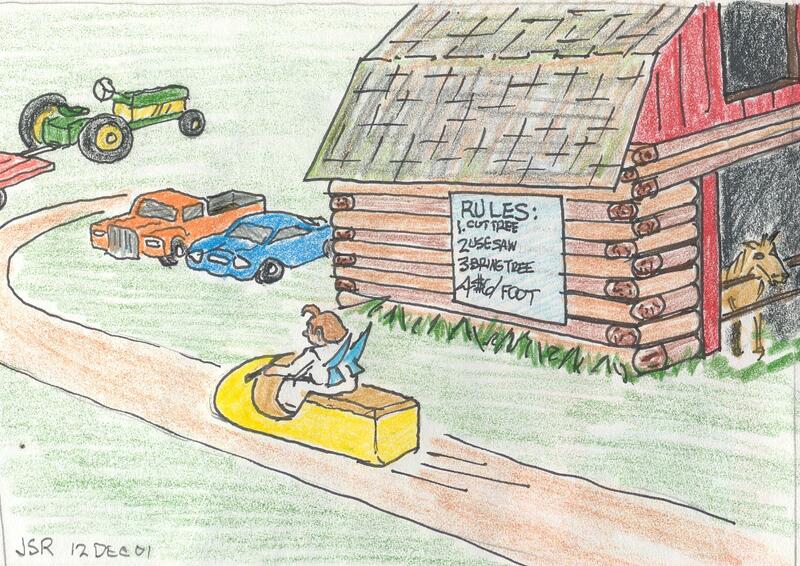 He spotted the sign for parking, and another sign on the barn stated rules for cutting Christmas trees. 1. Cut the tree at the ground. Do not cut in the middle. 2. Use only the saw provided. 3. Bring your tree to the barn for wrapping. 4. Trees are $8.00 per foot. Morty grabbed a saw and jumped onto the hay wagon behind the tractor. A cow mooed, and the horse whinnied in the barn. Chickens wandered all around the barnyard pecking for seed. He sat and looked around while he waited for the farmer. Gosh, look at all those trees. They surround the entire pasture as far as I can see. He daydreamed while he sat waiting. Farmer Jim raises trees. He sells some at Christmas, and takes the large ones to the lumber mill in the town. He plants replacement trees to keep the forest alive. It takes fifty years to grow a tree big enough to sell for lumber, and twelve years to grow a tree tall enough for Christmas. Morty sat staring at the trees and talking to himself. I love coming to the tree farm. It is fun to explore the woods. The forest is beautiful, peaceful, quiet, and majestic. I talk to them and they talk to me. When we are alone I hug them. Farmer Jim had a secret grove of old trees. He never cut these trees nor did his father, grandfather, or great-grandfather. His great-grandfather told him that they were there when he came to the farm in 1875. Some of them were two hundred feet tall. Morty discovered the grove last year, and fell in love with the old trees. His favorite was over two hundred years old. It lived through much of the history of our country. The big tree was a teenager when the very first settlers moved to the valley from the east. I have to find a tree to give to baby Jesus on his birthday. I will invite my friends to help decorate, and make it special. The hay wagon jerked forward, and broke his thoughts. He was on his way to find the perfect tree. 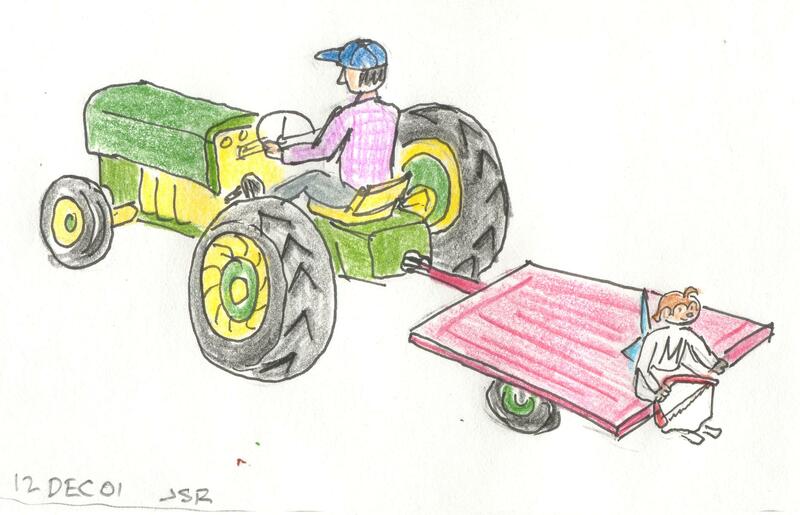 Farmer Jim drove the tractor, and Morty sat on the trailer. When they reached the field Morty jumped off. With a saw in his hand he began to search for the perfect tree. He wanted a shapely tree with branches all around. It could not be too big because his room was small. Morty wandered among the trees searching. Most were already five to six feet high or taller. Many had bare spots and deformed branches. With so many trees picking one was not easy. On the way to the farm, when he flew over the trees on his scooter, they all looked beautiful, but at ground level, they did not look as perfect. Morty began asking the trees for help. “Please help me find the tree I need,” he said. “I want it to be as tall as I am. It must not be too wide. My tree will have a triangular shape, and full branches all around.” The trees responded by saying they were once exactly like that, two or three years ago. After searching the forest for a long time, Morty stopped in front of a very tall tree. “Thanks,” said Morty. He took the tall tree’s directions, and counted the trees as he walked. When he reached number twenty, he turned left and counted five more. There, in the center of a small clearing stood a beautiful spruce tree. 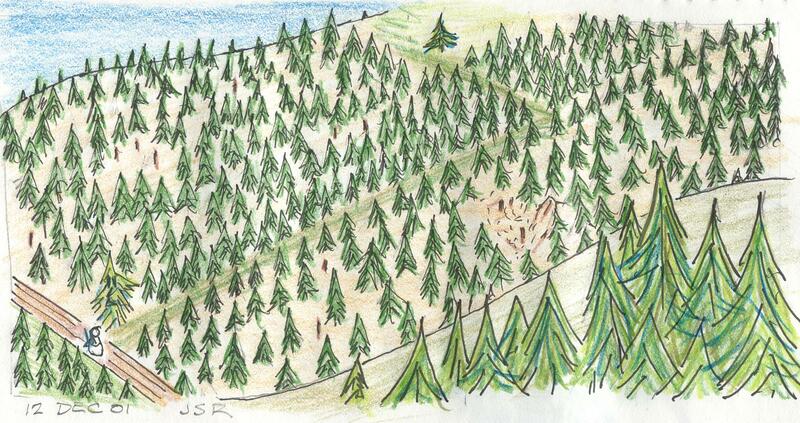 The Covert tree farm stretches across the countryside with pine trees of all sizes. Morty Angel can tell the age of the trees by how tall they are. The trees along the road to the entrance are a good example. Field number one has twelve foot trees. Next, is a field of ten’s then a field eight’s. Occasionally, a field was bare with only stumps protruding from the ground. Morty came to the sign ‘Covert Tree Farm, Christmas Trees for Sale,‘ next to a road that led into a grove of very old spruce trees. 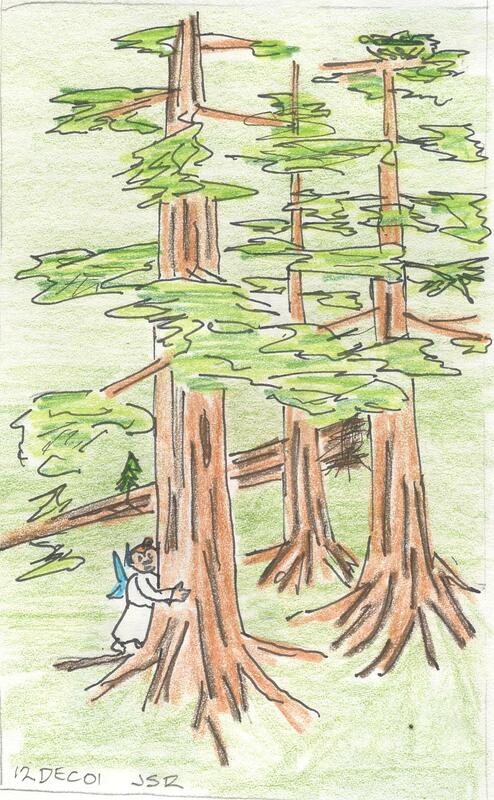 The tall trees shaded the forest floor, and kept it dark. The driveway was curvy, and made from gravel. Morty could hear birds flitting between trees. Beams of sunshine peeked through the trees. They looked like spotlights shining through onto the dark forest floor. Very little vegetation grew, except ferns; they require little light to survive. Morty steered his Skye Scooter through the forest over the twisty road. He was anxious to find a tree that would serve as his gift to the Boss. He saw an opening of intense light that led into a glorious meadow. This is where the tree farmer lived in a log home. Another sign announced that parking was in the field behind the barn. A sign on the barn stated rules for cutting Christmas trees. Rule One: Cut the tree at the ground. Do not cut in the middle of a tree. Rule two: Use only the saw provided. Rule Three: Bring your tree to the barn for wrapping. Prices are $8.00 per foot. Next to the barn, a tractor hitched to a hay wagon was running and ready to carry visitors to the cutting field. A cow mooed, and a horse whinnied from inside the barn. 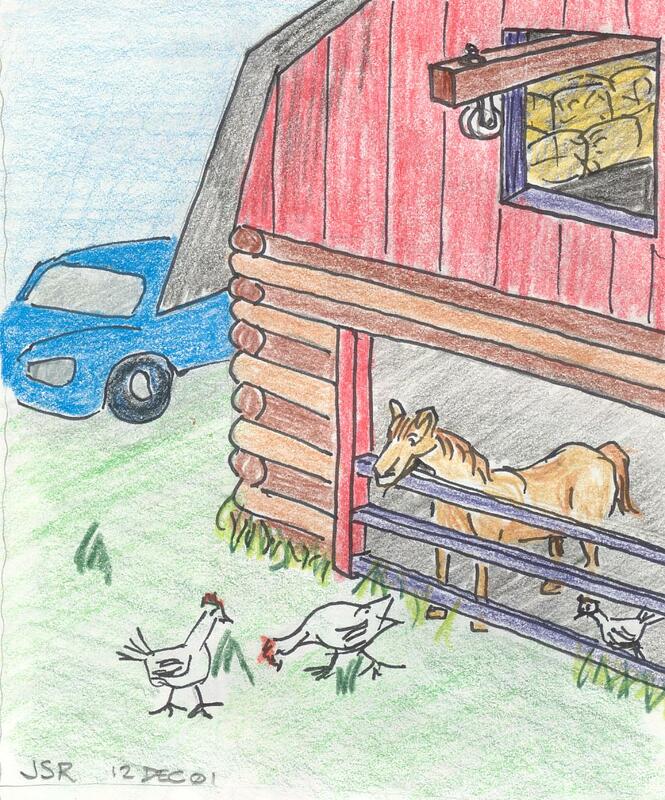 Chickens wandered freely around the horse and cow in the stalls, and in the barnyard pecking for seed. All around the barnyard meadow, there were trees and hills for as far as one can see. Farmer Jim lives on the tree farm. He raises trees for a living. 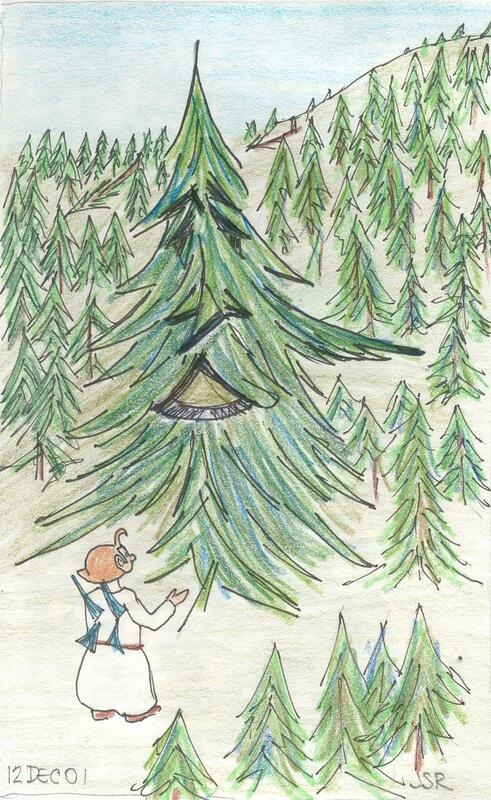 He sells some trees to visitors at Christmas, and he takes the very large trees to the lumber mill in the town. Farmer Jim always plants replacement trees after cutting a field. In this way, the forest continues to refresh itself. It takes forty to fifty years to grow a tree large enough to sell for lumber. It only takes ten to twelve years to grow a tree large enough for Christmas. Morty loved scooting out to the Covert Tree farm. It is a beautiful place, peaceful, quiet, and majestic. Morty also loved to talk to the trees. When he was alone in the forest, he would hug the large ones. Farmer Jim never told anyone, but he had one very large field of old trees on his farm. He never cut these trees nor did his father, grandfather or his great-grandfather. Farmer Jim’s great-grandfather told him that the trees in this field were on the farm when he bought it. The trees in that field were very big and old. Some were more than two hundred feet tall, and the trunks were so large that the farmer could not stretch his arms around the base. Morty really loved these trees. The largest tree was several hundred years old. It lived through much of the history of our country. The big tree was a teenager when the very first settlers moved to the valley from the east. Today, Morty came to the tree farm because he wants to surprise the baby Jesus on his birthday with a spruce tree. 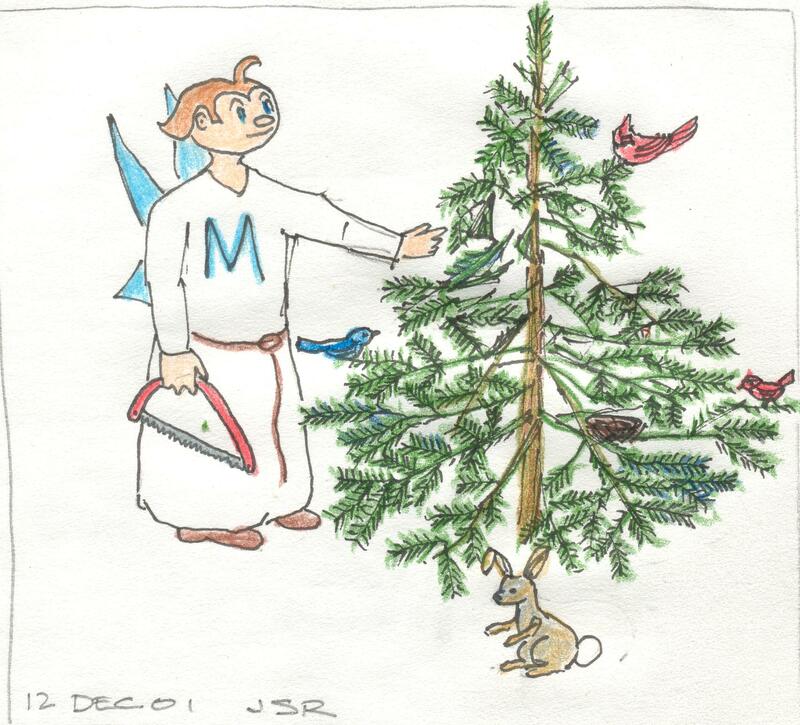 Morty will decorate the tree to make it special. He parked his scooter behind the barn, read the rules, picked up a saw, and rode out to the field of trees on the hay wagon.